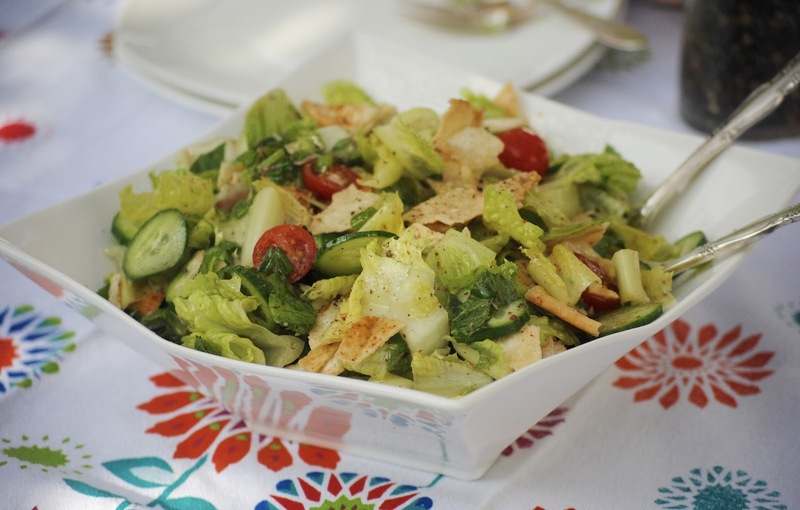 This week for Cook the Book Fridays we have picked David's version of Fattoush. Fattoush is a bread salad popular in the Middle East, made with torn pieces of stale or toasted pita bread. Bread in a salad is something I grew up with. 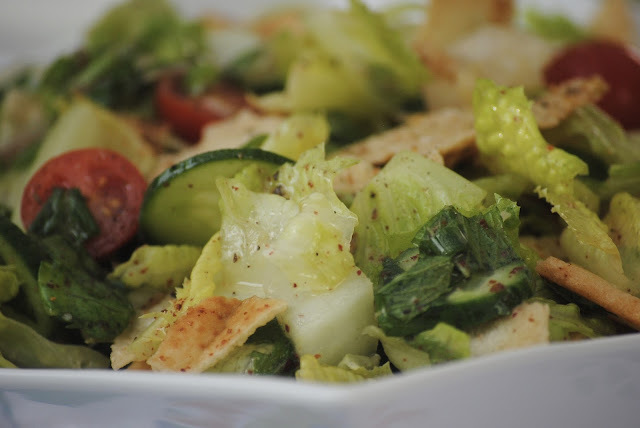 Fattoush was one of my favorites. It would be interchanged with Tabbouleh on my grandmother's table. It also fit my grandmother's mantra of never wasting food and was so wonderfully delicious that you never knew you were eating stale bread. Notice the sprinkling of sumac...love the sour taste it adds. Grandmothers have been doing it for generations. Some of our favorite foods come from grandmothers who didn't want to waste that stale bread. Think about it. The Italians have their own version of bread salad called Panzanella. I made a wonderful version with butternut squash that you can find here. We can also thank our ancestors for French Toast and Bread Pudding. Waste not, want not. There is something about crisp pieces of bread soaking up all the juices in a salad that makes my mouth water. Combined with crisp greens, tomatoes, mint, green onions, parsley and a delectable lemon based dressing this salad is something to swoon over. Davids recipe is almost exactly like my grandmothers...sans the mustard in the dressing. That said, I loved the flavor the mustard added. I didn't have to buy anything unusual for this salad since I always have sumac in my house. If you want to try this unusual middle eastern spice, which adds a delightful sourness to the salad, you can find it at Penzeys.com. This was a winner with my hubby. Although he added Parmesan cheese to his and told me the cheese made it! Happy Friday everyone! Since David's version has been shared many times I am sharing it here with all of you. Cook the Book Fridays is cooking through David Lebovitz's cookbook, "My Paris Kitchen". If you would like to cook along with our group or just check out what the other bloggers thought of this salad check it out here. In my hubby's words, "A definite keeper." Heat the oven to 350 degrees. Put the pita bread on a baking sheet, brush them evenly with olive oil, then toast for 10 to 12 minutes, or until crisp. Remove from the oven and let cool completely. In a large serving bowl, whisk together the lemon juice, salt, garlic, and mustard. Whisk in the 1/2 cup of olive oil. Add the lettuce, scallions, cucumber, tomatoes, parsley, mint, and radishes. Toss the salad with 1 teaspoon of the sumac and a few generous grinds of pepper. Crumble the pita into irregular pieces that are slightly larger than bite-size and gently toss until the pieces of pita are coated with the dressing. Sprinkle the salad with the remaining 1/2 teaspoon of sumac and serve. 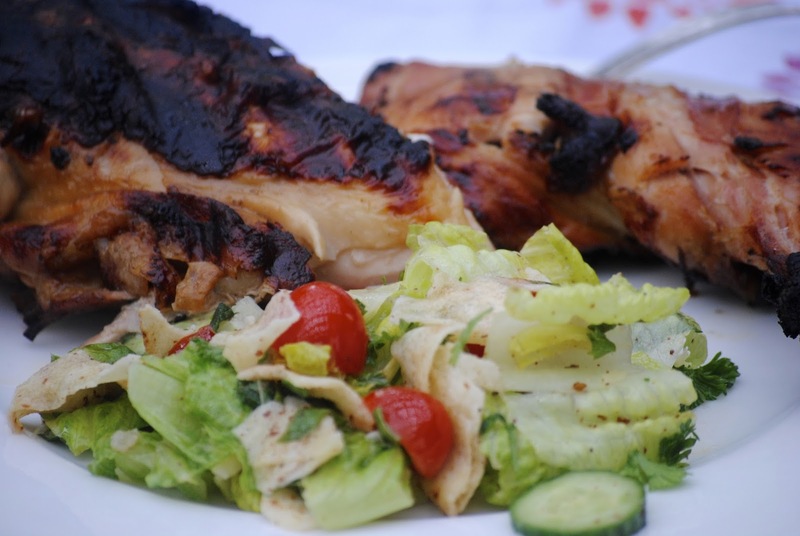 I'm loving the sound of this salad---perfect accompaniment to so many summer meals! Love it to hear stories how certain food reminds you of that special someone in your life, like grandma. Food waste is a concerning issue. Grandma is right! I love to use leftovers and this one was great. Your salad looks beautiful in the white square salad dishes and I really like the idea of adding parmesan cheese. I was wondering what you would think of this recipe because I knew it wouldn't be your first time eating it. Glad it got your approval (and Bill's). When your grandmother made it did it have lettuce? That's the part I didn't actually like. Happy Friday, Kathy! 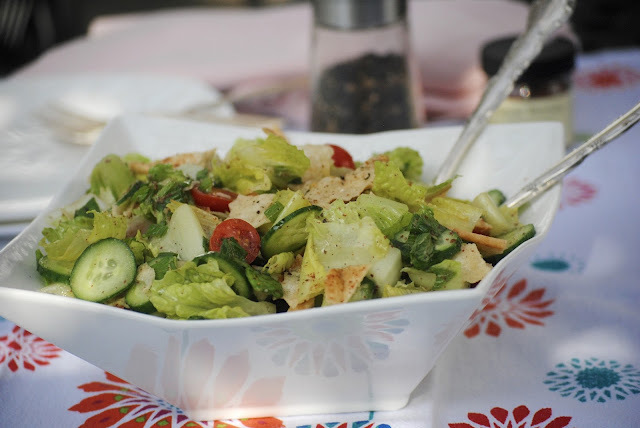 Your fattoush looks terrific, and yes, it does sound like a great way to use up leftovers. I approve of Bill's choice - Parmesan would be terrific with this salad. I was out of sumac, so I used za'atar instead. It worked really well. I love that this salad is almost the same as your grandmother's - it makes it feel very traditional (though the addition of mustard is both French and inspired). The sprinkling of sumac makes all the difference, doesn't it? The salad looks fantastic! What a great idea--we always have leftover pita bread! I agree! A definite keeper. And I also love, as you mention, how interesting it is to see how cultures have dealt with leftovers like stale bread! Or even things like old chickens (coq au vin)! Anyway, I can also see that parmesan adds a nice bit of umami to the salad that takes it to the next level. Looks gorgeous, Kathy! the next recipe, it looks fantastic. Have a wonderful weekend Kathy. I love fatoush! 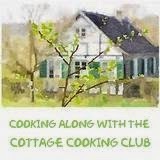 This is a great recipe - thanks! I agree with Bill that this is a definite keeper. I didn't change anything either. I think you served that with grilled chicken. Right? A good combination. Thank you for reminding us to waste not, want not. One of the things I work hardest at is not wasting food. It's easier here where I have so many willing samplers than in California. I have a friend who travels frequently and every time she leaves town for more than a week, she brings a sack of perishables to me. It's fun to devise ways to use them and share with others. I love that you have a family connection to this. Those foods always seem to taste the best! Like you I always have sumac in the house. My favorite spice! I would have to try with Parmesan the next time! But I'll skip the mustard! I love sumac! Marion goes through bread by the loaves, lol...however, I do remember grating up Sunday's hard rolls with one of those box graters for my grandmother's meatballs. I always managed to get one of my fingers. I had to laugh at your hubby's addition of Parmesan cheese and thinking that it made the salad. My husband added cheese to his too! It sounds like this recipe is pretty authentic. It was certainly delicious! This is one of the best ways to have salad. There really is nothing to dislike here! I love your story and agree that food should never be wasted. There is always something to do with the leftovers and extras!